Now this always confused me, and still does to this day. Â How come there can be two different sweets with the same name? Â I’m referring to the oddity that is Refreshers. The first kind of Refresher were originally made by Trebor (now Bassetts), and the one I remember most from my childhood, are the hard round fizzy sweets. Â Made of a kind of chalky looking substance they had a real tingly taste when you popped them on your tongue. Â Officially billed on the packet as fruit flavour fizzy sweets, they came in a stripy packet and were green, yellow or pink in colour. Â I have no idea what flavour each colour was supposed to be, but they were very nice. 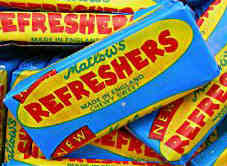 The other type of Refresher are made by Matlow’s and must have been around for just as long as the others, possibly even longer going by the design of its wrapper which looks a little old fashioned today. 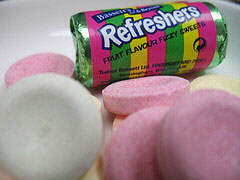 Â These Refreshers were named as simply “chewy sweets” by the wrapper, but they had a fizzy sherbet like centre which is why they were called Refreshers. They were available in a small size just a little too big for the average childs mouth, or a very long bar which you had to bite bits off of. So which is the real Refresher? Â I’ve no idea, and I like both varieties so I’m not going to complain. Â If you fancy reliving your youth with your particular favourite then use the following links to buy the round fizzy sweet versions or the chewy sweet versions. This entry is filed under Sweets and Snacks	and was posted on May 19th, 2009. You can follow any responses to this entry through the RSS 2.0 feed. You can leave a response, or trackback from your own site. Great find there, I love those things. Actually inspired me to look for more retro sweet stuff as I wanted a really nice gift for my fiancees niece. 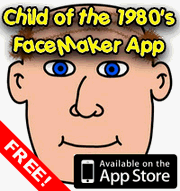 These guys have got a cool site which is pretty retro in its attitude before you even get to the products! Tons of retro sweets in there and some I had forgotten about! Spacedust or Wham bars anyone? !